Sales have begun for the “Ninja H2 SX” that is equipped with the Kawasaki H2 supercharged engine. We managed to get a chance to ride the touring spec bike that was released for sale from 1stMarch. In terms of spec it exhibits the same 200bhp as the 1441cc naturally aspirated engine of the Ninja ZX-14R sports tourer, so we will compare the two in this report and see what impressions we are left with. For this test report we were limited to 100km on the highway, 20-30km on back roads, so we hardly got to test things out on closed public roads. However, the traffic was light on the highway route, so we were able to fully enjoy what these bikes are made for. Incidentally, the SX we test rode is the standard version that does not come equipped with adaptive cornering lights or a quick shifter, and the 14R was a high grade model fitted with an ohlins rear shock. As you swing a leg over the 14R it feels long with a low centre of gravity, whereas the SX is short from front to back, with a tall stance that is slightly overbearing. That’s exactly why raised handlebars have been attached. Nevertheless, rather than a sports tourer, you could probably say that it is closer to a supersport feel. The seat height of the 14R is 800mm, and the SX is 820mm, so for a 70kg / 170cm in height rider like myself I wasn’t able to feel a great difference in terms of getting my feet down. However, when it comes to the difference in the centre of gravity, I felt that the 14R had a more stable feel when riding at very slow speeds. (Kawasaki Ninja H2 SX) There is also the top spec H2 SX SE model (Both machines in top picture) that has adaptive cornering lights and a quick shifter. (Kawasaki Ninja ZX-14R) This is a high grade spec model that comes equipped with Brembo brakes and and Ohlins rear suspension as standard. The 14R has two low beam / four high beam spot headlights, whereas the H2 SX has got the one eye projector style headlight set taken from the Ninja H2. The left-hand side of the bike has the air flow duct for the supercharger that is routed from the right-hand side of the headlight. The fuel tank is 19 litres. So how about the “balanced supercharger”? As for the observation of the SX engine, it has a good response in handling acceleration at any rate. Within the three engine modes on offer, it is the full power “F” mode in particular that delivers such a sharp response that it feels like your eyes might pop out, especially considering this is a tourer. Although the bike is not light at 256kg you can get it moving with little hesitation. In the “L” mode it sheds off 50% of the power output and becomes considerably more gentle, although it is not the case that the crispness disappears completely. The H2 SX shares the same clock meter design as the Ninja H2’s monochrome display. The top end SE model gets a colour display. The two cluster analogue meter design on the 14R offers a classic feeling. The upper part displays things like outside temperature and battery voltage. The 998cc four-cylinder engine equipped with a supercharger that kicks out 200 bhp & 14.0kg-m, gives one the feeling of how this bike has been designed to be an “absolute weapon in order to ride fast”. This is the kind of bike that without feeling as though you are making much effort, you find yourself hurtling down a straight line at insane speeds. From 8000rpm this thing really pulls hard! There is no match for the feel you get from the crazy boost, but then, after all that’s exactly what Kawasaki have been intending with their special “Balanced Supercharged Engine Concept”. On another note, when you let the throttle off the whizzing sound that’s let out from the supercharger’s blow off valve is something that can be heard a long way off, but sadly as the rider you can’t hear it so well. In contrast, the 14R has a generally smooth reaction when opening and closing the throttle. The so called drumming noise is non-existent, and, meant in a good way it feels like a carbureted bike with a more relaxed reaction that doesn’t press the rider so hard. Perhaps it might be a bit sluggish for those kind of riders who put emphasis on sportiness, but when you crack open the throttle in top gear from around 2-3000rpm, the sound and vibration really give you that feeling of how you are indeed riding a “four-cylinder Kwacker”. This sensation could be felt instinctively for someone like myself who has owned a ZZ-R1000 in the past, as I found myself saying “Yes, yes – this is just like it!”. Meant in a good sense, the 14R retains the feel of Kawasaki models from the past. This is a top bike with a high quality finish and appeal. Of course, as is also the case with the SX it was announced how the 14R would blow your mind away with a strong 1441cc four-cylinder, 200bhp and 16.1kg-m of torque offering a real feeling of power. If you open the throttle, it sends you into a warp in a split second in the same way as the SX. However, as you break into high revs together with increased speed, you can feel sharp vibrations more than ever, much like the characteristics felt in a traditional internal-combustion engine. The way it shifts through the gears is a strong point on the 14R. The body of the bike also leave a different impression. The 14R has an aluminium made monocoque backbone frame, and is heavy weight, so it is appropriate how it has been fitted with top suspension in tackling bumpy roads. Of course, it also deals with sporty riding too, but much like sailing a large ship it allows you to flow gently into a high pace. Crossing the cylinder head is the 14R aluminium made monocoque backbone frame. 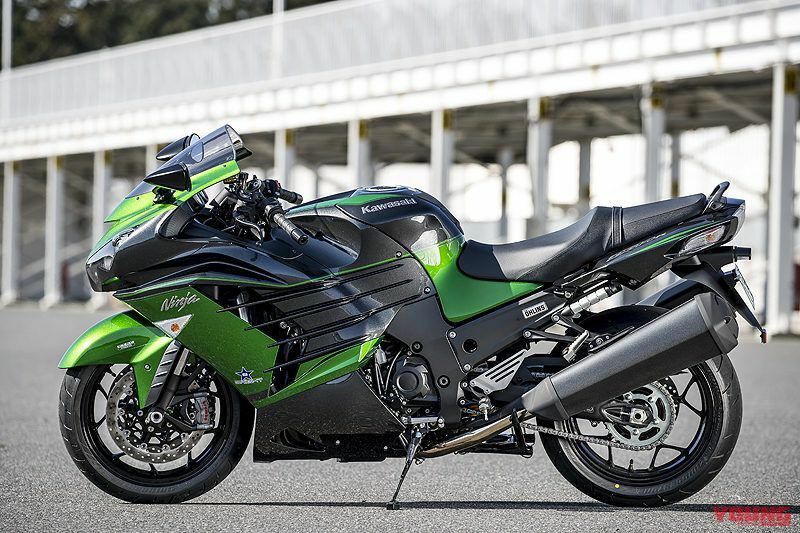 First introduced in 2000 on the ZX-12R, it has been close to 20 years since this unique style of frame from Kawasaki has been in use. In comparison, the SX is certainly nimbler with a sharp reaction to rider input. The steel pipe trellis frame allows for a softer feel to the core of the body, and, in comparison to the 14R that “allows you to sit on board”, the SX seems to be more active in operating, and it is exactly this that offers the rider enjoyment. With my lack of any true riding talent (and Japan’s laws), I couldn’t very well step into such fast paced territory, but even at over 200kph the bike is very lively in response to the rider’s actions. The 14R clearly differentiates how to tackle certain road surfaces, and you can feel how your riding influences the machines behaviour with the large amounts of feedback and great reaction it offers. Although this bike may seem a bit on the bulky side, in truth it is a machine of great versatility. Kawasaki have the H2 SE continue making good use of the 2015 Ninja H2/H2R steel trellis frame. The production process takes some time, but it’s easy to make subtle adjustments in the rigidity of the frame, and it also offers the great feedback found in bending iron pipes. To generalise, the SX is not so much a calmer version of the base model Ninja H2 it shares a relationship to, but rather it holds itself up to be a thoroughly sporty bike. It has a more comfortable riding position that the H2, and surely going two up would be easy to do too. Pannier cases can also be fitted too, but for a machine that is sharp in acceleration response and has good reaction, it’s bound to be more appropriate for a rider that operates their machine in a sporty, lively manner. If this were to be illustrated in terms of cars, then this bike would be a BMW due to how it possesses both high practical abilities, and sportiness. In contrast to this, the suspension and engine of the 14R all react smoothly and are produced to a high standard. The rider is wrapped up in a tremendous sense of security, whilst there is a strong sense of how it “allows you to sit on board”. Despite having the ability of reaching outrageously high speeds, just by cruising within the speed limits you can fully appreciate what a great bike you’re riding. This is refinement and luxury. One can probably say, so to speak, that it comes close to the world of Mercedes-Benz. Perhaps Kawasaki consider the H2 SX as the successor of the ZX-14R, but our impression is that the two bikes are deceptively similar products. Like trying to work out which one is better is difficult, as neither of them are bad. The fact is that there are two attractive bikes here to choose from based on what you would use it for, or simply which one takes your fancy.